K-Seal Using K-Seal How Does K-Seal® Work? Leaking coolant can be the ruin of any car engine if it isn’t identified in time. If you suspect your car has sprung a leak, it needs to be dealt with as soon as possible. The secret behind K-Seal’s ability to repair a coolant leak is down to its contents: a specially developed blend of chemical ingredients including ceramic microfibres and copper particles. When added to the cooling system the ingredients disperse and flow freely around the system suspended in the coolant. 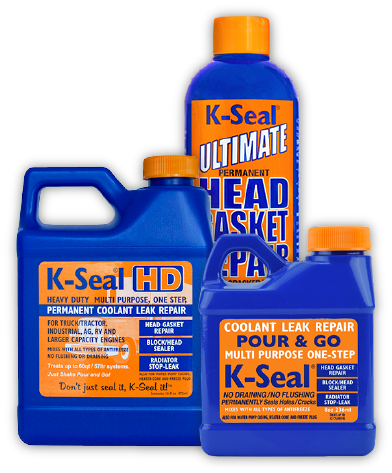 If coolant is leaking from the system, either externally (look for a puddle under the engine) or internally across the head to the cylinders, then K-Seal will follow it through the hole or crack and try to fix the leak. Once the crack or hole has been located, the microfibres instantly begin to mesh together within the gap, building a seal literally fibre by fibre to stop the coolant leaking through the gap. The particles in our K-Seal products are very precisely designed to be large enough to repair holes up to 0.635mm in size but deliberately small enough to never block any passageways or tubes within the cooling system, including those inside the heater core and radiator. Once the microfibres have sealed and fixed the leak, a combination of exposure to either the external atmosphere or the gases within the combustion chamber and the heat within the cooling system and engine causes the K-Seal formula to cure. This results in an extremely strong and permanent seal able to withstand even the high pressures from the combustion chamber. This is how K-Seal ULTIMATE is able to repair head gasket failures, even where the cooling system is being over-pressurised by exhaust gases entering the system. K-Seal can deal with all of these leaks and more, as long as they are identified as early as possible. It is easy to use – simply shake it and pour it into the coolant mixture and it will work automatically.